There's no doubt or subtlety here. While fashion choices certainly involve a huge component of personality and individual preference there are common standards which are instinctively understood. Many business and general cultural traits are similar. In business though the changes aren't accompanied by visual cues that provide a constant reminder. That's why it's easy for companies to insist that change isn't really happening in their industry; that lengthening sell cycles and rising "no decisions" are just a blip; that the consecutive 2% declines in gross margin are aberrations; or that technology won't disrupt their corner of the industrial world as it has others. Yet companies learned during the last existential crisis for manufacturing (the quality and pricing challenges of the outsource/import 90s-00s) that recognizing incremental environmental change in manufacturing operations is critically important. Because one day, suddenly, all the overlooked warning signs combine into a crisis. So today companies are rigorous in applying scientific management to manufacturing operations. Decay in quality rates, delays in ship dates, and minor degradation in OEE all attract immediate attention and rigorous process. 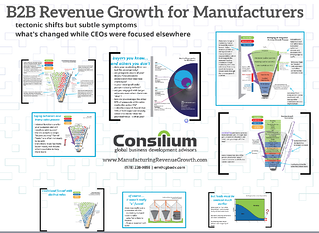 There's a stark contrast in companies, however, between this scientific approach to manufacturing process and the cavalier approach to revenue growth. But it's even more hideously inappropriate than wearing silly clothes. According to SiriusDecisions and Forrester research recapped by Bob Appolo, the problem is fundamental. One needn't be a savant to visualize the problem, but to push the dots really close together, Appolo provides this visual. Buyers are completely focused on their selfish interests - their business issues. Of course today's marketing and sales organizational staffing and operational foundations were developed in a very different time; a time when buyers needed sellers to tell them about products because there was no other way to learn about them. Buyers' toolkits have expanded and they no longer need marketing and sales to inform them of products and services. But B2B sales and marketing, particularly in capital equipment and other complex sales environments, hasn't caught up. Where they used to intersect, today the two are parallel lines which will never converge. Or perhaps the better analogy is that from the intersection in the 80s, the lines are diverging; ever more distant from each other. The function is revenue growth. 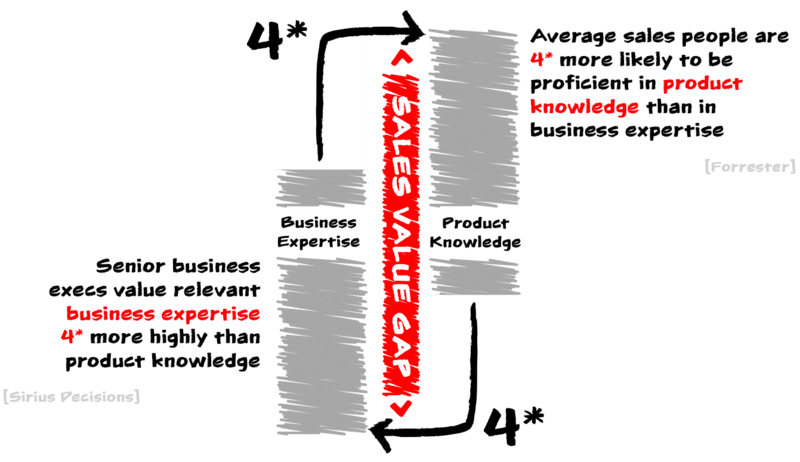 PR, marketing, sales and customer service are blurred elements on a continuum, and the vestigial corporate structure that breaks them out is only applicable in that there are different concentrations of skills required at different points along that revenue growth continuum. Disagree? If you're searching for solutions to a problem, do you care whether the helpful information you find was posted in a press release or a service tech forum? Or when you live chat, call or email a prospective company, is your goal to speak to someone with a specific title? Or to get a full answer to your question? That's what I figured. As prospects and buyers we're clear that we want a process that enables, educates and helps us - so why do we turn around and force a marketing and sales construct on our buyers that's antithetical to our own preferences? I've never met a VP of Sales who would countenance a discussion about shifting staff and resources from field sales to inside sales/marketing. It's antithetical to their interest and world view. But that's the conversation that needs to happen. And not just conceptually. The most productive inside sales people may be the veteran field sales reps who have the most application experience - or maybe everyone becomes inside sales who occasionally makes sales calls. Similar silo resistance exists in each department. It's frustrating, but it's natural and understandable. That means, however, that adapting to today's buyer expectations isn't a task to be delegated across today's org chart. It is a strategic responsibility of the CEO. The company will be the winner, but make no mistake, there will be individual "losers." The good news is that done right, this will be a process of natural selection; team members with the right mindset (a growth mindset) will experience the angst of disruptive organizational change, but they'll adapt. Those who strenuously resist will do so because their view, which was shaped in a different commercial era, is incompatible with today's requirements. It's critical that the board and CEO be involved for additional reasons. Early signs of disruption - equally threat and opportunity - will be collected, interpreted and reported through the revenue growth team. Companies need to ensure they're market intelligence collection is unencumbered by politics. An adaptive revenue growth function which maps to buyer expectations will become a strategic asset. Few companies will adapt quickly - we'll see a shakeout as we did as companies struggled to embrace Lean. Those that do will be positioned to grow - by holding their ground during the disruption and acquiring market share, or distressed competitors. The data byproduct of strategically managed revenue growth operations will become a significant asset. Whether as revenue growth IP, a distinct asset which can be monetized in new ways, or a foundation for evolving cloud business models, the data will have strategic value which shouldn't be kept locked up in marketing's domain. Bill Gates observed that we tend to overestimate the pace of change over the next two years and underestimate what will happen over ten. Are you being realistic about both time frames? And how about today's and tomorrow's buyers that are being forced down an outdated chute to your sales slaughterhouse? Think they might find a competitor more helpful even in the next several days? Disruption is fact. Planning and reaction is a choice. And there are no right answers since the outcomes are inherently uncertain. What's clear in the short term is that some companies are having the discussions and others aren't. Which are you? 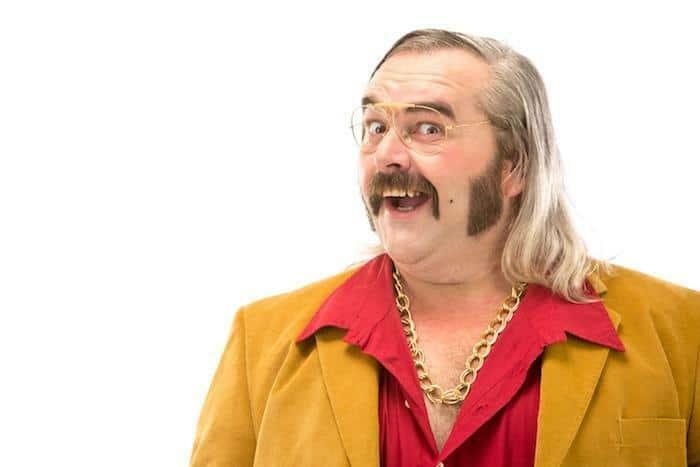 Are you confidently headed out for sales calls wearing your leisure suit?